The original iPad’s A4 chip was called S5L8930X, the iPad 2′s A5 chip was called the S5L8940X, and now this A5X chip is labeled as S5L8945X. Notice the jump of 10 in the labeling on the A4 to A5, and notice the jump of only 5 on the A5 to “A5X.” The 5 would note a half-way upgrade, something that an A5X chip with improved graphics, but still dual-core processing, would be likely referred to as. Going by this naming scheme, the next major iOS device processor revamp (A6, not A5X) would be called the “S5L8950X.” Now, we discovered evidence to support Apple is working on that specific chip. 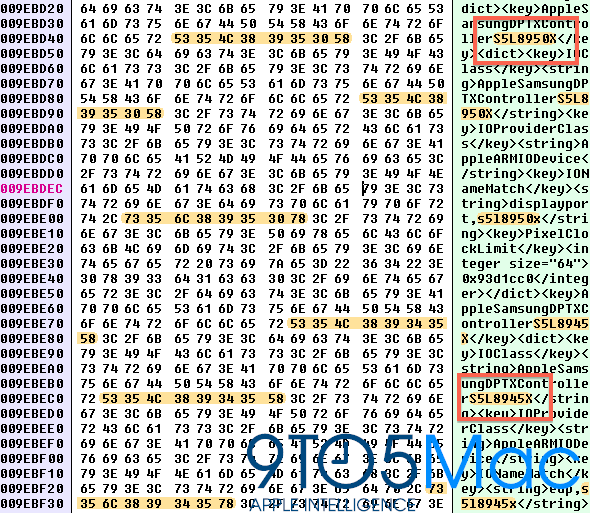 Deep in the iOS 5.1 betas (as shown below) sits references to two next-generation iOS device chips: the previously discussed S5L8945X and this new S5L8950X. While nobody found the 50X (A6) chip in the code until now, we can report that both next-generation processors entered the iOS code simultaneously. This would seem to indicate Apple is working on two next-generation chips. In any case, the evidence that Apple is working on two next-generation chips, an enhanced A5, and a completely new chip, is here. What is not clear is which chip will land in the iPad 3 in early March.